Is this the missing ingredient in Australia's curriculum? Is this the missing ingredient in Australia’s curriculum? This article originally published in The Educator. An engaging food literacy program providing primary schools and early learning centres with evidence-based hands-on education has now gone national, allowing children in all states and territories to reap its benefits. 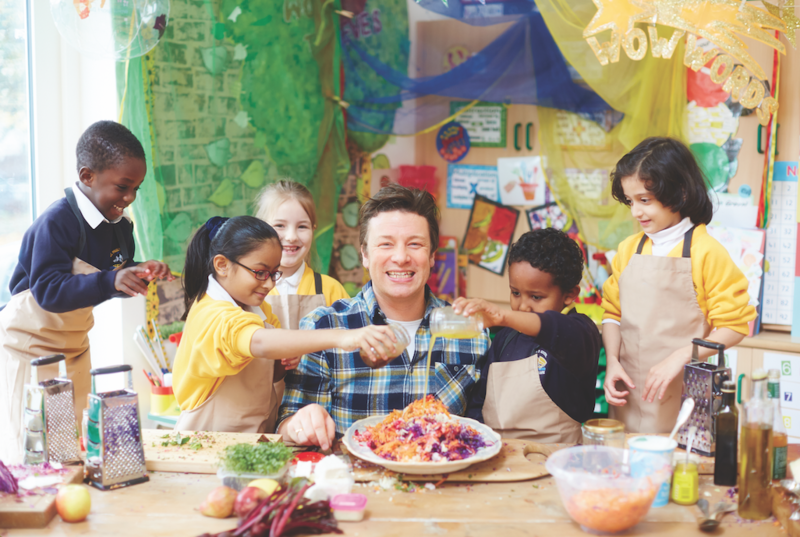 Jamie Oliver’s Learn Your Fruit and Veg program – an initiative delivered by The Good Foundation – engages and excites children about fresh food by teaching them simple to follow and quick to prepare recipes, using Jamie Oliver’s signature cooking tips and shortcuts. National research commissioned by The Good Foundation has revealed that the majority (71%) of Australian kids aged 3-17 are not getting the recommended daily intake of fruit and vegetables; with less than a third eating veggies every night. Andrew Muir, The Good Foundation’s, founder and director, said the significant demand for Jamie Oliver’s Learn Your Fruit and Veg program illustrates a growing appetite from schools to improve food education in the classroom. “In 2019 and beyond, I believe we’ll continue to see more and more schools signing up for programs like ours to improve student health and wellbeing – especially while a comprehensive food education framework remains to be seen in the Australian curriculum,” Muir told The Educator. The Foundation’s research shows that kids who are exposed to fruit and veg regularly from a young age are more likely to consume them as adults – so early intervention has become the most obvious strategy for tackling the issue. “Research also shows that kids who cook more often, eat more fresh vegetables, therefore teaching them basic cooking skills is a key factor in establishing lifelong good habits,” Muir pointed out. Muir said that enabling kids to have a hands-on and fun experience with fresh produce breaks the pre-processed diet cycle and can kickstart a lifelong interest in nutrition. “It’s been great to see a surge in demand for new programs like ours as it shows Australia is starting to take notice and get serious about improving the overall health of our nation,” Muir said. Karen Martini, Australian chef, author and ambassador of Jamie Oliver’s Learn Your Fruit and Veg Australia said one of the biggest challenges that parents face is getting the foundations right for the long-term health and well-being of young people. “As a mum, I know what a challenge it can be to get your kids to eat fresh vegetables on a daily basis, but we must persevere,” Martini said. She added that the program “redefines the next generations’ yummy without preaching” and makes it fun and creative. “All children need to feed themselves eventually. It’s our job to teach them how, in a way that is completely fun for young inquisitive minds and in turn promotes a healthy development,” Martini added.